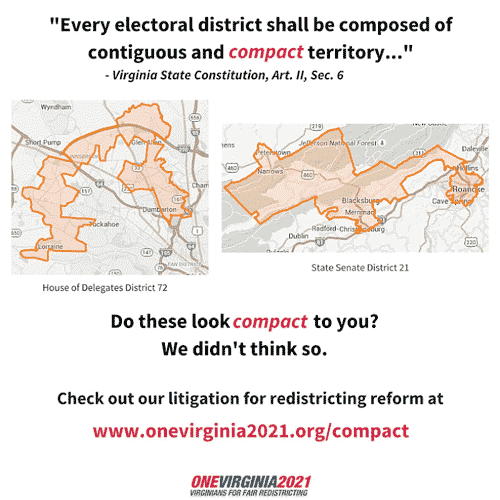 Redistricting Reform, Gerrymandering in Virginia. Fairfax Grassroots. The Virginia legislative session ends in February. We need to act now in order to get it done in time for the 2021 redistricting! ★ Overview of OneVirginia's proposal. GERRYMANDERING is the deliberate manipulation of legislative district boundaries to advantage or benefit a particular party or group, or to cause disadvantage or harm to an opposing party or group. It distorts the electoral process, undermines democracy, and renders legislative elections a meaningless exercise. It’s a conflict of interest for the legislature to draw it's own district lines. What is the current process in Virginia? In Virginia, state legislators redraw district lines for the U.S. Congress, the Virginia House of Delegates and the Senate of Virginia after every 10-year census. Under the current system, the party in power in the House and the party in power in the Senate can draw the lines to serve their own interests, not those of our communities. Virginia is ranked as one of the most gerrymandered states in the country both on the congressional and state levels based on lack of compactness and contiguity of its districts. Virginia is ranked the 5th worst in the country. Throughout the Commonwealth, counties and cities are being broken in half or into multiple pieces to create heavily partisan districts.